Profitez de votre séjour à Villa Olivee Bellagio! Villa Olivee, dans les temps anciens, était un vieux homstead, complètement restructuré en 2009. Entouré d'un jardin d'oliviers séculaires dans un endroit calme et ensoleillé, à seulement 10 minutes à pied du centre de Bellagio et à 100 mètres de e lac. - Au rez-de-chaussée, la cuisine, une salle de bain avec douche, une salle à manger avec salon, canapé et télévision par satellite. Nicest VRBO home that I have ever rented. Very clean and so nicely furnished with all of the little amenities that make a stay enjoyable and makes you want to return. 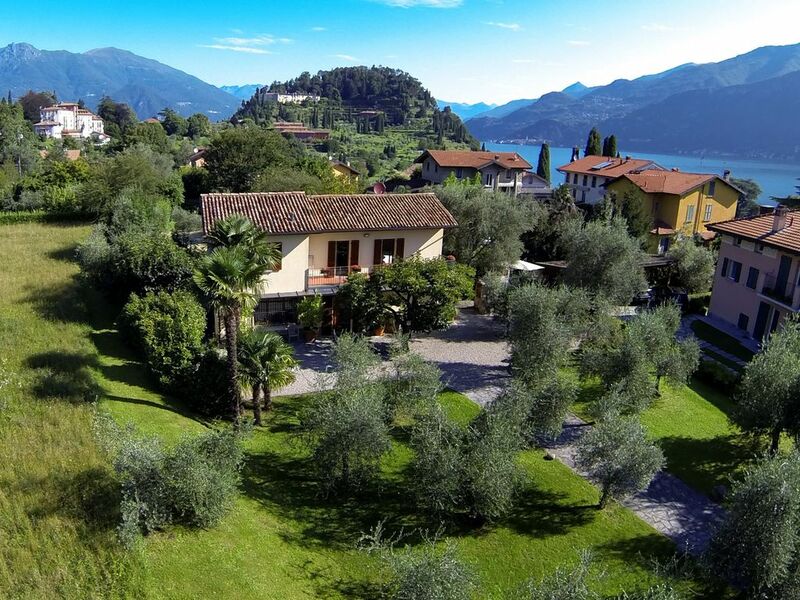 Very walkable to Bellagio and other small towns in the area. Great parking and very secure home and location. Relaxing spaces indoors and outside in the garden area. I would put this at the top of my list in looking for a home in the Lake Como area. Dear Gayle, we want to thank you for your beautiful review. We are very happy that you have enjoyed your stay at villa Olivee and hope to accomodate again in the future! I stay in VRBO rental units at least 3-4 times a year, and this was honestly the best property I have ever had the pleasure of staying in. It was beautifully decorated, equipped with everything a traveler could need (there were even fresh eggs, milk, butter and bread). The beds were heavenly and Mary and Lucca were so kind and attentive. If you are planning a trip to Bellagio, this really is the place to stay. I am already dreaming of my return. Luca greeted us with enthusiasm! We had a delightful stay with incredible amenities including. breakfast makings and an espresso machine. The towels were changed daily and the accommodation was immaculate and charming. It was a short walk to Bellagio! Thank you for a wonderful stay! Ciao Linda, thank you very much for your beautiful review, it's very important for us! Whether you want hike the pre-alps or are looking for a quiet retreat in one of the loveliest areas on Earth - this is the place to stay. Highly Relcommended. Dear Donna, Richard, Sarah And Nate, We would like to thank you very much for the nice review And your appreciation, it is very important for us! Many greetings, we hope to welcome you again! Perfect way to experience Bellagio! The four of us have been exceptionally happy with this place! It's in a perfect location, just outside the city centre and is equipped with every single thing you can think of. The appliances and other systems are completely up to date and yet the Villa has a wonderful historic feel to it. The beds are super comfortable and all you hear is the tweeting of birds. I haven't slept so well in ages. Luca and Mary (our hosts) are very friendly and responsive. Highly recommended! Thank you Very much To all of you for the fantastic review And for Your appreciation, it's a pleasure To accomodate kind guests like you! Hope To host you again In the future! Villa Olivee is lovely and in a fantastic location. Luca was a fantastic host and made us really welcome. The villa is very well equipped and feels like a home. Both our teenagers comment how 'at home' they felt there. We didn't hire a car and enjoyed walking everywhere. I've love to return again. Hi Julia, thank You very much for your fantastic review, it's very important for us! Dans un quartier résidentiel, à quelques pas du centre historique de Bellagio et les principaux services. Le village se caractérise par des bâtiments centenaires, des ruelles et des escaliers de pierre pavées pittoresques bordées de boutiques mettant en vedette les plus belles marchandises italiennes. Bellagio, et en particulier, Pescallo, a été proclamée par beaucoup d'habitants comme la Perle du Lac. Il est certainement l'un des villages les plus photogéniques de toute l'Europe.